The ECM uses the vehicle speed signal and signals from the transmission revolution sensors (NT, SP2) to detect the actual gear (1st, 2nd, 3rd, 4th, 5th or 6th gear). The ECM compares the actual gear with the shift schedule in the ECM memory to detect mechanical problems of the shift solenoid valves, transmission valve body assembly or automatic transmission assembly (clutch, brake or gear etc.). The engine revs freely when a shift to 3rd or 5th gear is commanded. When a shift to 1st gear is commanded, 3rd gear is engaged. When a shift to 2nd gear is commanded, 3rd gear is engaged. When a shift to 6th gear is commanded, 5th gear is engaged. The ECM commands gear shifts by turning the shift solenoid valves on and off. According to the input turbine speed and output shaft speed, the ECM detects the actual gear (1st, 2nd, 3rd, 4th, 5th or 6th gear). When the gear commanded by the ECM and the actual gear are not the same, the ECM illuminates the MIL and stores the DTC. OFF malfunction (A) and (B): 0.5 sec. OFF malfunction (C): 0.8 sec. Duration time from shifting "N" to "D"
(f) Enter the following menus: Powertrain / Engine and ECT / Active Test. The 4th to 5th and 5th to 6th up-shift must be performed with the accelerator pedal released. The 6th to 5th and 5th to 4th down-shift must be performed with the accelerator pedal released. Do not operate the accelerator pedal for at least 2 seconds after shifting and do not shift successively. The gear commanded by the ECM is shown in the Data List / Shift Status display on the Techstream. (h) Compare the ECM commanded gear and the actual gear. *2: If shift solenoid valve SLT is stuck on, the line pressure will be low. Therefore, the amount of torque that can be transmitted by each gear is lower than the normal limit. When the engine power exceeds this lowered limit, the engine speed will increase freely. *3: When shift solenoid valve SLT is stuck off, gear shifting is normal. 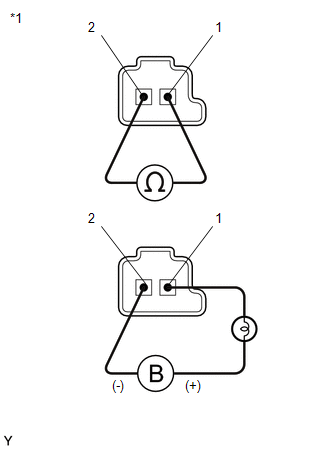 (a) Remove shift solenoid valve SL4 (See page ). There is no foreign matter on each valve and they operate smoothly.